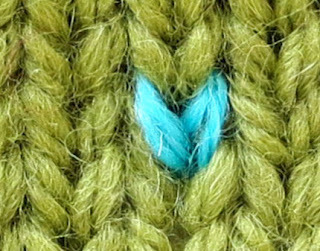 Duplicate stitch is a form of embroidery worked on a stockinette fabric. It gets its name because the path of the embroidery yarn exactly follows--duplicates--the path of the underlying knitting. Today's post, first of a series, shows the how-to, as well as a few little tricks to overcome some common problems. The second use is when a perfectly sound fabric has duplicate stitch on top to add color-decoration. 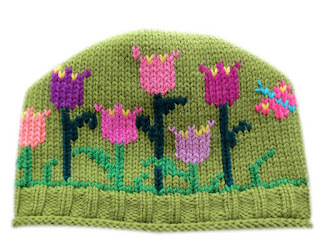 You have certainly seen this use, the little hat below was worked in classic duplicate stitch. Naturally, the uses overlap. A colorful flower worked over a thinning elbow, or a little heart over a moth-hole in an old glove combine utility with decoration. As you might-imagine, working another strand of yarn into each underlying stitch thickens and stiffens the fabric. For utility use, this isn't much of a problem. When mending a thinning heel, restoring thickness is actually the aim. Similarly, stiff reinforcement improves little kid sweater-elbows. Further, since mending is done "invisibly" (in a matching color yarn) there is no issue about appearance. For decorative purposes, the situation is different. When working a secret message into the lining of a hat or a flower motif on a sweater front, thick, stiff fabric is not going to be popular. Using a contrasting-color yarn causes appearance problems, too. For one thing, putting a different color yarn on top gives the bottom yarn a chance to misbehave by peeping through. Classically, duplicate stitching is worked with a yarn of the same weight as the underlying garment and this is fine for utility use. But for decorative use, the best results come with using a thin yarn, doubled. Laying two strands side-by side increases width without increasing thickness, reducing both peep-through and bulk. 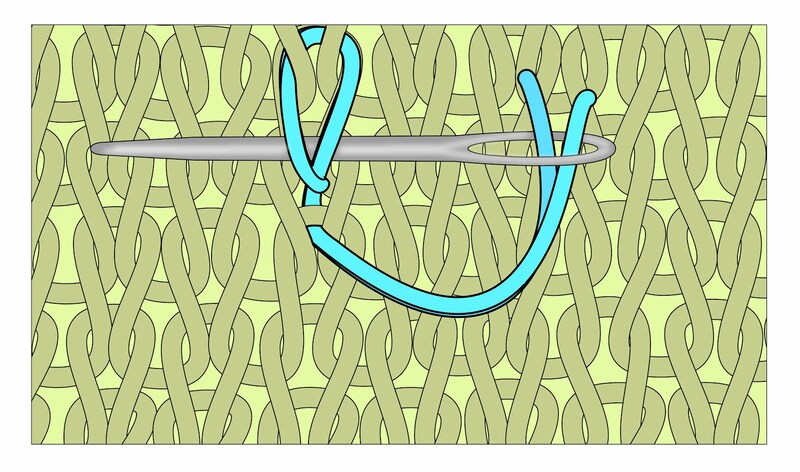 Using a thin doubled strand also lets you fastening the strand to itself at the start, a trick called "self-anchoring,"or "loop-anchoring." Self-anchoring means you only have to work in the tails on the end, rather than on both ends because the beginning is a tiny loop with no bulk at all. Draw out a length of embroidery wool twice as long as you can comfortably work, then fold it in half. Thread the two cut ends of the yarn through a dull-pointed large-eyed needle. 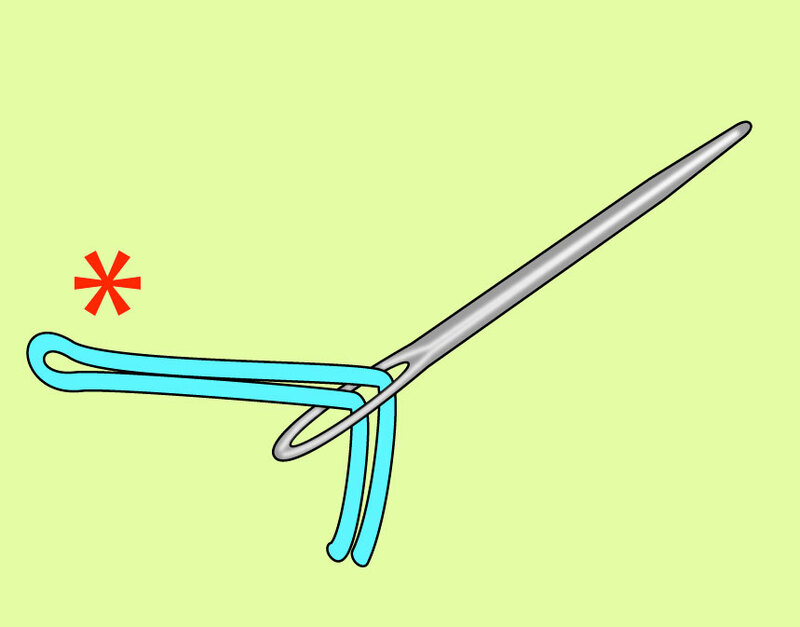 The self-loop--created by the thread doubling back on itself--is at the end away from the needle, as the illustration below shows (red asterisk). 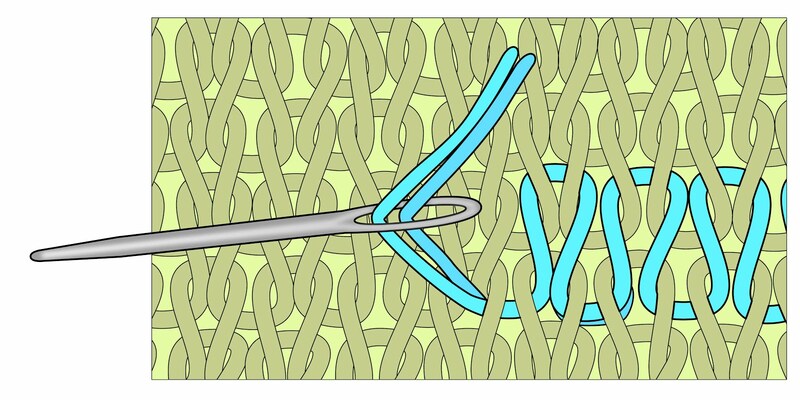 Naturally, the yarn in the below illustration is too short to use in real life, and you would use a much longer one. It's just shown that way for, well, illustration purposes. 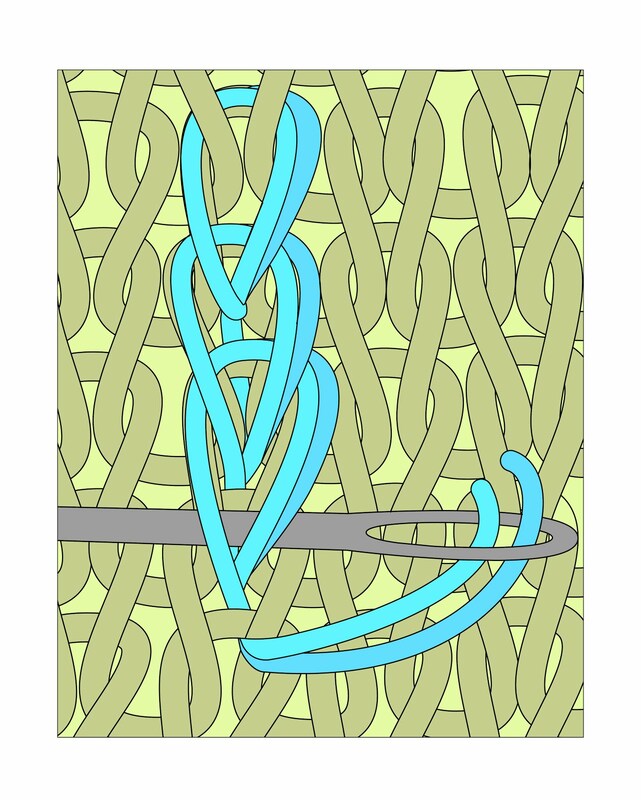 As the illustration below shows, hold the the smooth side of the stockinette fabric facing you. Insert the needle from back to front just where the arms of the target stitch (red) emerge from the stitch below. Peek at the fabric back be sure a small bit of the self-loop remains open, as shown on the photo below. In the photo below, the target stitch has been colorized red. Working from the front fabric face, insert the needle sideways through both arms of the stitch above the target. In other words, the needle follows the path of the top loop of the target stitch. Right handed knitters will find it easiest to insert from R to L as shown, left handed knitters, the opposite. The needle next goes down onto the fabric back in the exact same spot it came up, having traced the entire outline of the target stitch through the fabric. On the fabric back, draw the needle through the waiting self-loop, gently snug up. 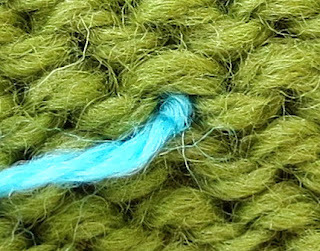 The final result is shown below: a self-anchored strand waiting for the next stitch, no ends to work in. 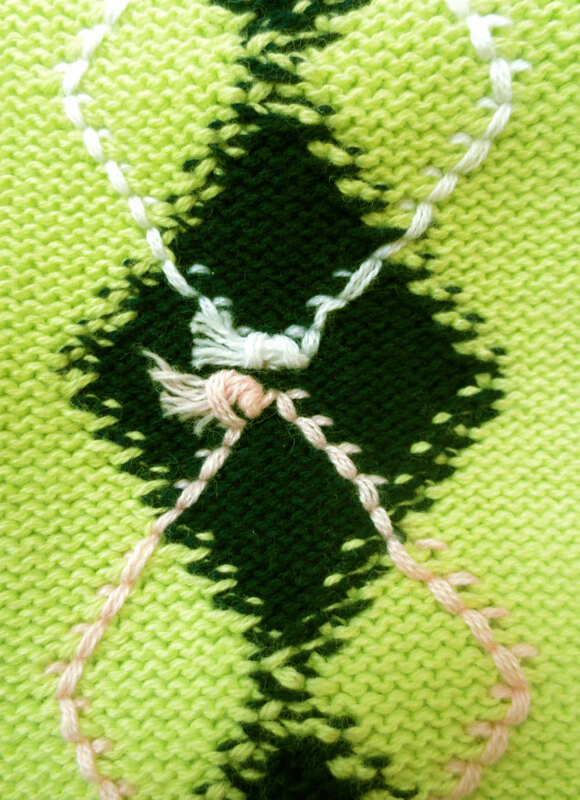 As shown below, the final result on the front face of the fabric is a duplicate stitch. You can see the two strands of the blue yarn spreading out to lay side-by side. Be very gentle snugging up each duplicate stitch. You want to leave plenty of yarn on the fabric surface to reduce peep-through of the underlying color, and to avoid the problem of collapsing the fabric with tight stitches. As to how to get from one stitch to the next, the rule is always: take the shortest route. This is completely opposite to most needle arts (especially needlepoint) so ignore any prior training you may have. Taking the shortest direction through the fabric back reduces bulk. You can work duplicate stitch row-wise or column-wise. You can also decide which way the stitches should point--up or down. 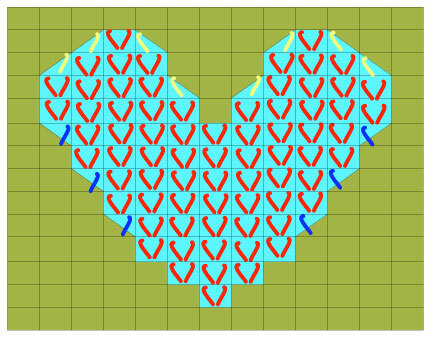 The most perfect duplication of the underlying stitches comes when you work the duplicate stitch row-wise, meaning, from R to L or L to R (or both, when working a larger area). This is because you are actually following the direction in which the stitches were knit. When we come to repairing fabric via the duplicate stitch (it will be the third post in this series) it will be important to work row-wise for this reason. If you choose to work in columns, you have two choices. First, you can work each individual stitch step-by-step as set forth above. 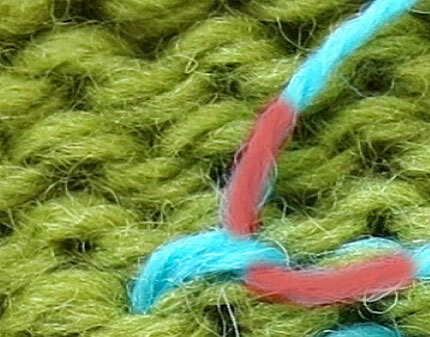 Or, you have another choice, a "sort-of" duplicate stitch--a trick called "chain-duplicate stitch" or "chaining." Chaining actually lies more on top of the fabric than true duplicate stitch. Specifically, the bottom of each stitch goes through to the fabric-back, but the top part of each chain lies on the surface, passing only through the arms of the duplicate stitch (but not the underlying knit stitch) above it in the column. This somewhat reduces bulk and makes for a more flexible fabric, but at a price: peep-through is higher. Let's take the down direction with a threaded needle first--the embroidered chain stitch. 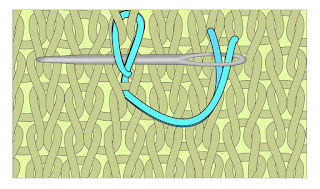 If working with a thin yarn doubled (recommended) you would begin at the top of the column via self-anchoring, as described earlier in this post and as shown on the top stitch of the illustration below. For the next lower stitch in the same column, you bring the threaded needle out of the fabric from back to front in the bottom point of the target stitch, in the same manner as for working individual duplicate stitches. 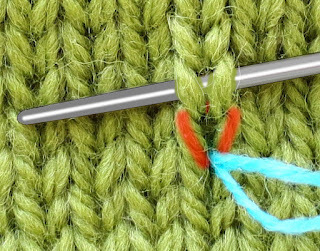 However, the next step is to insert the sewing needle from right to left under the arms of the duplicate stitch only, rather than under the arms of the underlying knit stitch, as illustrated above. 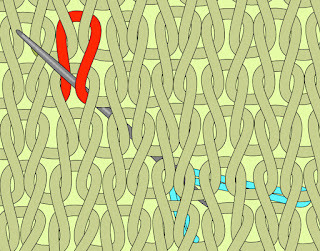 After drawing the threaded yarn through the arms of the duplicate stitch above, the needle is returned to the same place it emerged, and is drawn to the fabric back. 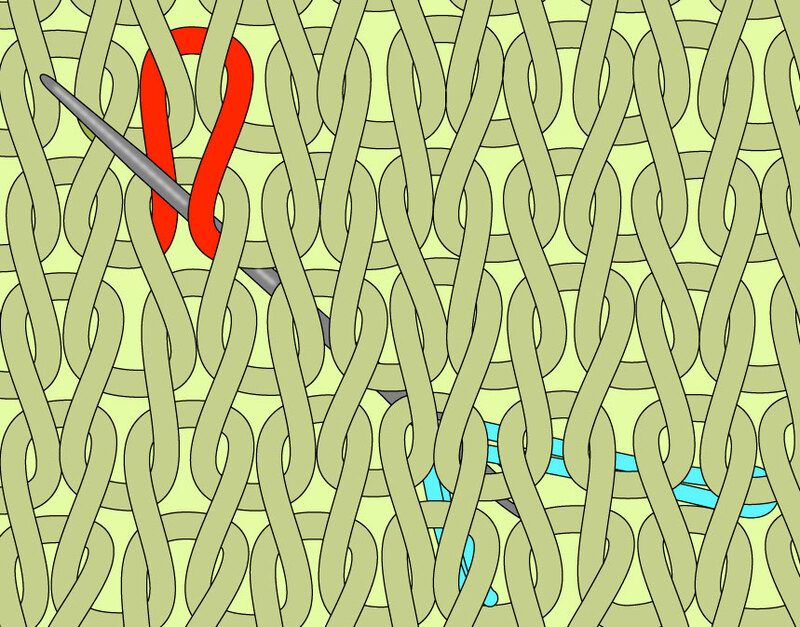 These steps are repeated to form a chain which goes through to the fabric back at the bottom point of each underlying knit stitch, but which at the top, only passes through the arms of the chain stitch at the surface of the knit fabric, as illustrated below. The crocheted slip stitch is simply a variation of our old friend the pinstripe (subject of the past several posts). However, rather than working the slip stitch into a purl column as for a "real" pinstripe, here, we work the identical maneuver into a knit column. Here is a link to the first pinstriping post. It contains a you-tube, showing the crocheted slip stitch in a purl column. Again, the chain stitch is performed exactly the same way as shown in that post, only you work it over a knit column, rather than a purl one. 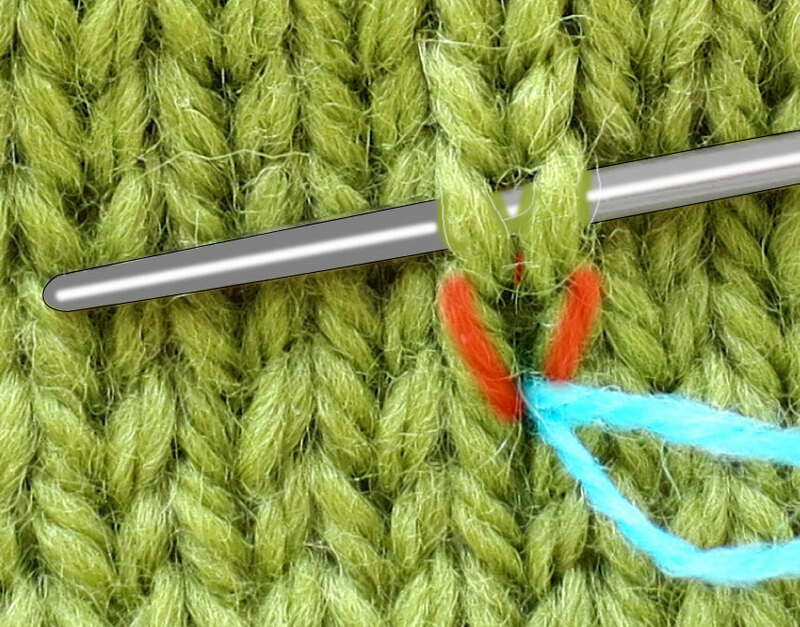 As you approach the top of a slip-stitched column, stop one stitch early. Rethread the yarn on the back onto the dull-eyed sewing needle you were using for the embroidered chain stitch and work the last stitch as a regular duplicate stitch. This fastens down the loose loop and leaves the yarn at the fabric-back when done. You are now in position to work the next neighboring column down again, via the embroidered chain stitch. Below are front and back photos of a little square worked via chaining, the "down" stitches worked via the embroidered chain stitch, the "up" stitches worked via the crocheted slip stitch. As you can see, the columns are identical, both front and back. 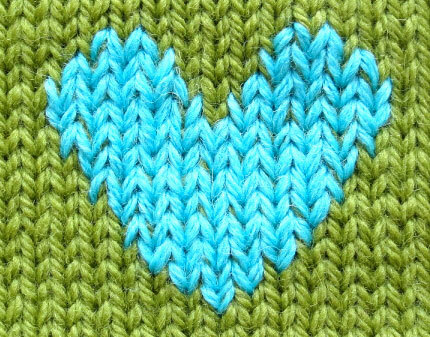 (As you can also see from the above photos, peep-through is more of an issue with chaining, compare the coverage of the blue over the green background to the coverage in the heart photo which was duplicate-stitched row-wise with the same yarn on the same knit fabric). 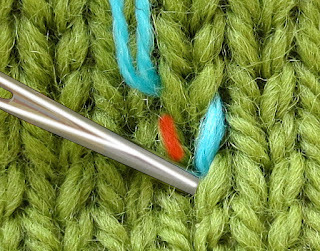 Pointing down (V) vs. pointing up (^)--which way should your stitches point? At the end of each length of yarn, work in the remaining ends by taking off the dull-pointed needle, then rethread onto a sharp-pointed needle. Skim in the ends. Once you've got some duplicate stitches on the front, here's another trick you can use to reduce bulk (assuming you're working with a thin yarn, doubled). Anchor every strand after the first by threading a single strand of wool through the needle eye, then draw this single strand under a nearby duplicate stitch to the half-way point, then fold up the yarn to make a loop-bottom (colorized red on the below photo). 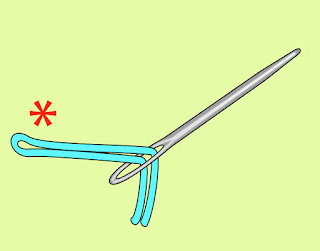 Finally, thread the second strand through the needle eye, so that two cut-ends of the strand are though the needle-eye, as previously. Easy-peasy and no bulk. Here's a duplicate-stitch trick which is not well-known. Just as in cross-stitch embroidery where you can have a partial stitch (one leg of the cross) so in duplicate stitch, you can have a partial stitch, too (one arm or another of the "v"). This little trick helps smooths out the curves, reducing the pixelated stair-step appearance of duplicate stitch, and this is true even when the half-stitch leans away from the direction of the curve. 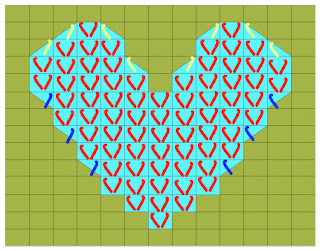 On the below chart of a duplicate stitch heart, the shape of the stockinette v's is shown in red. 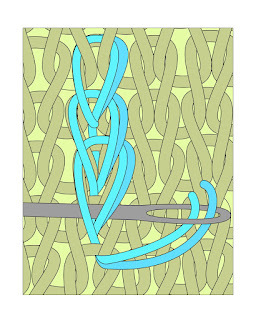 Partial stitches which lean away from the direction of the curve are shown in blue, partial stitches which lean in the same direction of the curve, in yellow. I think the finished heart in the wool shows the smoothing action regardless of which way the half-stitch leans. To my eye at least, the little heart is a lot rounder and plumper than it would be without the half-stitches. 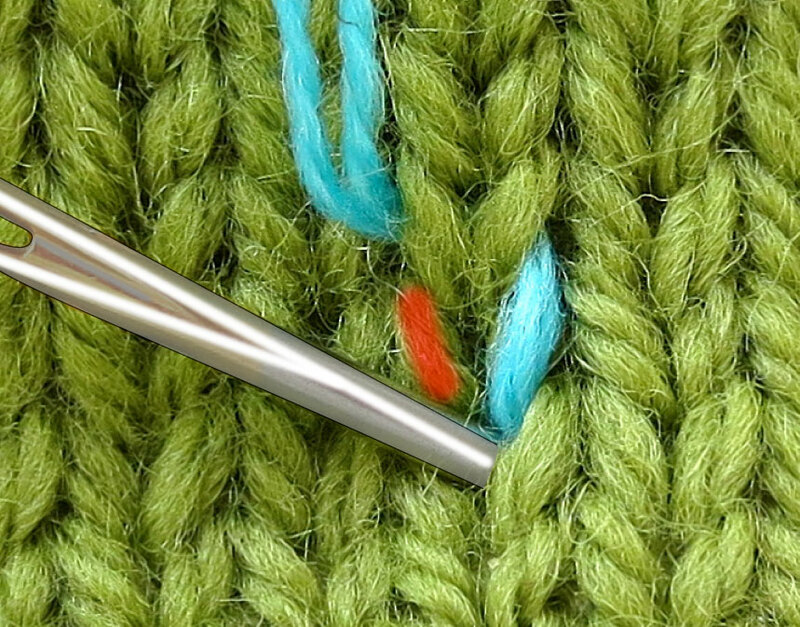 This trick means you can go one better with duplicate stitch than with knit-in color patterns. 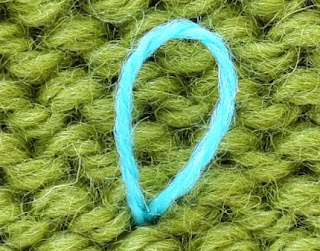 In other words, it's not possible to knit a half-stitch, but you can duplicate-stitch a half-stitch. 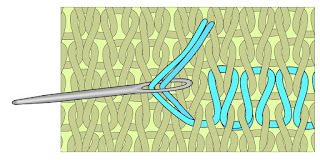 So, even if you dislike duplicate stitch because of the heavy and stiff fabric it produces, or because it isn't "real" color knitting, the perfectionist in you may want to consider using duplicate stitch just a little to reduce the pixelation effect caused by the the stair-steps of whole-stitches in "real" color knitting like intarsia or stranded knitting. If you search Ravelry for duplicate-stitch projects, you can see quite a range, from masterpiece florals in graduated colors echoing cross-stitch or needlepoint, to children's cartoon characters. 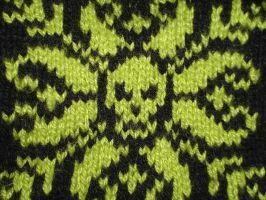 Another place in particular where duplicate stitching shows up is argyle knitting. 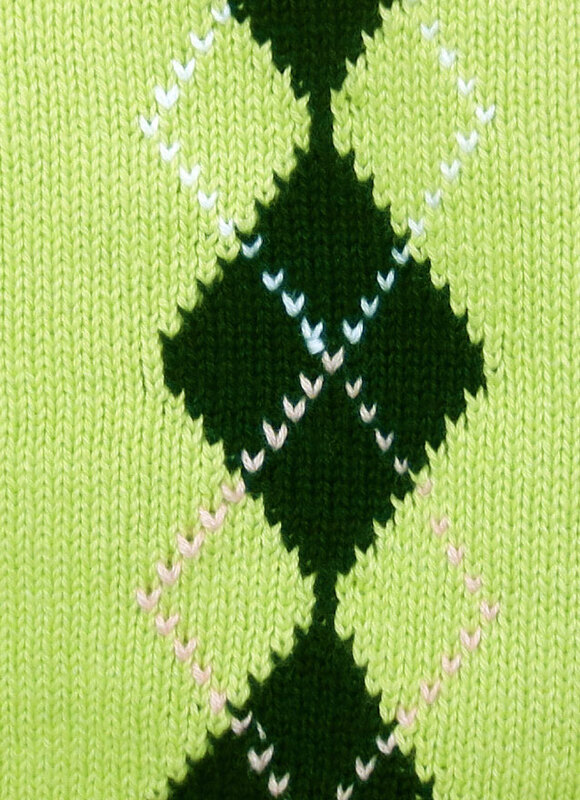 Although the diamonds are knit-in using the intarsia method, the diagonal dividers are often added afterward, via duplicate stitch, rather than running a separate bobbin for each. Even die-hard knitters may find this a worthwhile dodge, to say nothing of lazy knitters such as myself. In fact, even commercial argyles, knit on giant computerized knitting machines, sometimes use this trick, as you can see above. Next time you're in a men's and boy's department, look inside one of the argyles on display, and you’ll probably see something like the right top photo, knots and all. Another perfectly fair use of duplicate stitch is to mitigate very long carries. Have a look at this Ravelry Page for a lovely sweater pattern called "Pixelated Pullover." If I were going to knit this, I'd modify the pattern to eliminate the very long carries on some of the outlying "pixels." 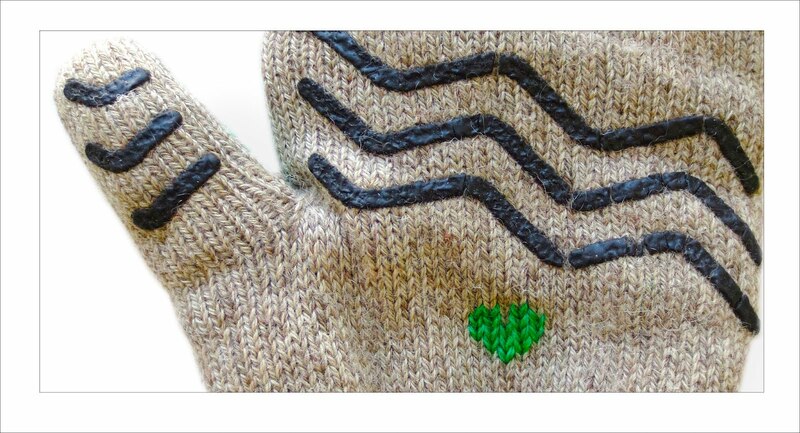 Instead, I'd create these as part of the finishing process by working duplicate stitch on the inside in a irregular "V" pattern, from the lowest to the highest, then down again, all around the sweater in a band. In other words, on the rows where the "pixelation" is crowded together, I'd work that row in two-color knitting (one yarn in each hand). 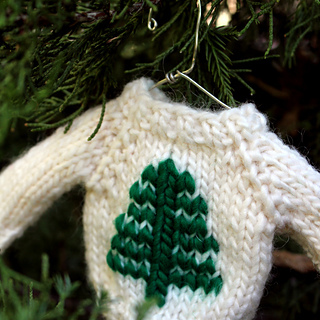 But for the outlying stitches, I'd go over the sweater with duplicate stitching after the fact. 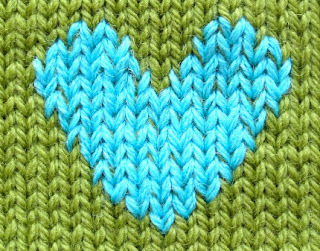 The next post in this series show a new and different approach to duplicate stitch. Maybe check it out before you commit to a duplicate-stitch project? 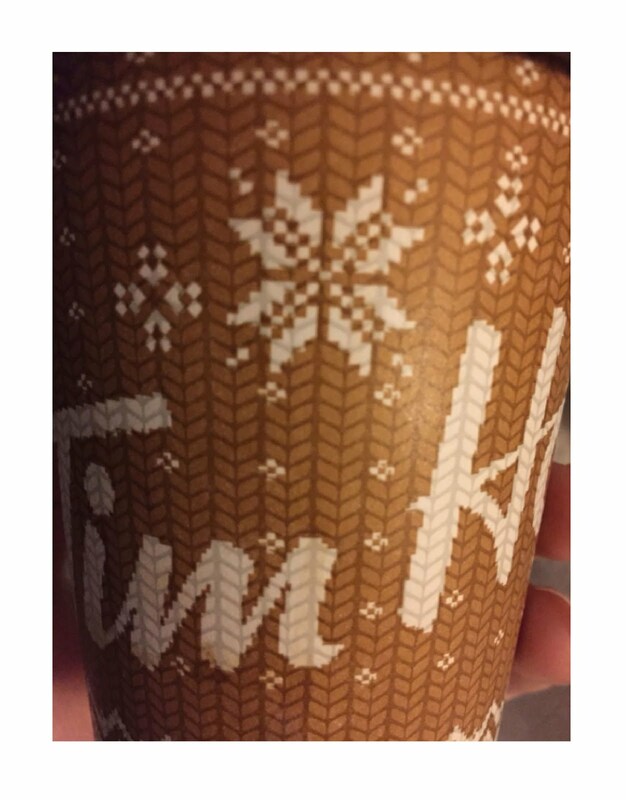 *Original source for the Tim Horton's picture. Photo and caption re-used by permission. Thank you BeeCDN.